BLOOMFIELD HILLS, Mich. - Jan. 11, 2019 - PRLog -- Many people are feeling stuck these days. Whether they're struggling with circumstances beyond their control, attempting to heal from a broken relationship, or seeking relief from feelings of unworthiness, loneliness, or jealousy, there's a surefire tonic: the true-life tale of one man whose sense of wonder and perspective never falters, regardless of who or what he encounters. Karen Wiand grew up with Eddie Lee in a small town in central Michigan, lost touch with him in early adulthood, and found their paths converging years later. She wrote Fast Eddie: Ten Ways to Turn Life's Journey into a Joyride to share the life-changing lessons she learned by spending time with her intellectually disabled friend and to offer help, Fast-Eddie style, to those who need a fresh perspective on how to handle life and any injustices it holds. Fast Eddie chronicles how Eddie, severely malnourished as an infant prior to being taken away from his biological parents, had the good fortune to be adopted by Tilly Lee, who knew there was something special about her baby son. Although many perceived Eddie as disadvantaged and unfortunate thanks to his lifelong intellectual disability, Wiand reveals how Eddie cheerfully renounced the whole concept of "disability" the moment he set his feet in motion on his first little bike. Ever since, his wheels have turned misfortune into a rich life, one that has benefited him and everyone he touches. 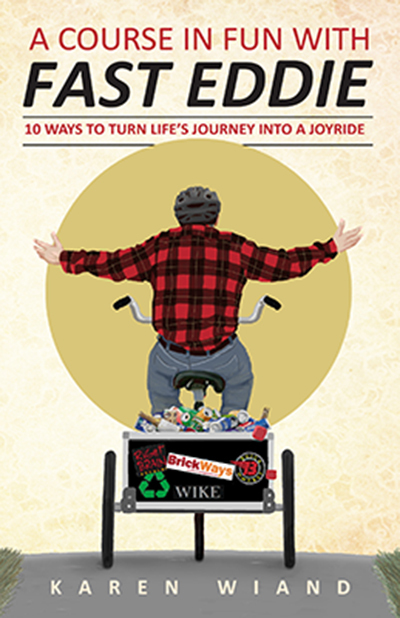 Detailing how Eddie's resourcefulness remains unscathed in the face of circumstances beyond his control, many of them abusive and demoralizing, Wiand notes, "His story demonstrates the special wisdom and gifts that those with intellectual disabilities possess. Able to consistently observe the world with openness and a sense of wonder, Eddie consistently invites us all to join him." Among the lessons conveyed in Fast Eddie are the importance of believing in yourself, staying active, bouncing back after rejection, and more. In effortlessly modeling these and other positive practices, Eddie indeed turns life's journey into a joyride. Wiand concludes, "Eddie is living proof that you can get from where you are to where you want to be by believing everything is possible and by relying on steadfast faith, courage, and happiness to let it all unfold before you." Author: Karen Wiand is a first-time author and full-time believer in our personal power to create miracles. She has enjoyed many experiences through her career, first as an art director and producer and later as a residential designer and builder in Birmingham, Michigan. She enjoys tagging along with Eddie and his friends around Traverse City. Thanks to them she has an insider's view of the special talents and needs of individuals with intellectual disabilities. : Carlysle & Lloyd, Inc.